Scott Owen in front of his "Inns North Iglu Hotel" where we have enjoyed kind hospitality. Surrounded by hundreds of kilometers of tundra, Baker Lake is a unique spot. Standing in the middle of town, you are supposedly at the very geographical center of Canada! However, it is the history and the traditional way of the people here that really grabs our attention. The first explorers to travel the river by the turn of the 20th century (late 1800 - early 1900's) were Joseph Tyrrell and Knud Rasmussen and his Fifth Thule Expedition. Considering Inuit were only believed to live along coastal areas, both of these expeditions were surprised to find Inuit living this far inland. Today, an abundant number of archeological sites along the river tells us about the Inuit who have lived here for centuries. Depending on the river and the caribou for sustenance, they are called the Inland Inuit or the Caribou Inuit. Only one other group of Inland Inuit exists - living in the interior of Alaska. The Caribou Inuits’ skills and knowledge were quite different from the majority of Inuit living on the sea who were dependent upon seals, walruses, and polar bears for survival! The earliest documentation describing these people was in the spring of 1922 when Knud Rasmussen and his friend the anthropologist Kaj Birket-smith traveled up the Kazan River meeting several groups. Their reports and photos stand as the most descriptive study of historic Caribou Inuit life. Knud Rasmussen is a world renown arctic explorer from Greenland who traveled throughout the Arctic in search of Inuit people, history, and legends with the ultimate goal being "how did the Inuit spread out and the various ways of surviving the harsh environment". Knud Rasmussen is one of Mille’s heroes (who is your hero? Go to the "Heroes and Dreams" collaboration zone to talk heroes!). Knud was a close friend of Mille’s great grandfather Morten Porsild who founded and operated the first Arctic research station in the world on Disko Island in Greenland. The first funding was given to her great grandfather by Knud Rasmussen who received the money from a donor to support another expedition. Knud who was born in Disko Bay (Ilullisat) in Greenland and truly believed and supported Morten's idea of a field research station and decided that the money would be better spent there. "A living legend" Martha Taliruq and her daugther Sarah. Talking with Orin’s wife Sarah about her upbringing in Baker Lake and how it use to be around here, she decided to invite us to see her mother Martha Taliruq. Martha is 83 years old and remembers how they lived as nomads on the land. It turns out she actually met Knud Rasmussen back when she was just 13 years old. She told us a funny story : "Knud Rasmussen had asked her mother to help him get a tent for their ongoing journey. Martha's mother then went ahead and sewed a beautiful double walled tent made out of canvas to give to Knutti (as they call him) as a gift. Knud would not accept the tent as a gift so he left behind some money when he took off. Martha's mother decided to save the money for when her husband returned from a hunting trip he was on. That same day, Martha and her sister we playing outside, practicing making fire for tea water. They were looking around the home to find anything they could use to burn. They found this paper which worked great for getting the fire going. Now, unfortunately it turned out that the paper was the money that her mother had received from Knud!!! Her mother did not get mad, though, as she knew her girls had never seen money before...." Martha told us many very interesting things - bringing us back to her time living on the land with her family. We feel very honored to have met Martha. Our new friend Kaviq Kalurak in front of her studio where she weekly announces Inuit youth news in Inuktitut. It was one of the two very treasured experiences we have had here in Baker Lake. The other one was meeting Kaviq Kalurak. Kaviq is a exceptionally gifted young lady. At 15 years old, she has a incredible drive for the future and a rare appreciation for the past. We got introduced to her because she is the local TV star. She is the news anchor for the weekly Nunavut Youth News announcing in Inuktitut - a program which air throughout Nunavut and in Manitoba. Kaviq took us to the Inuit Broadcast Company here in Baker Lake where these news programs (along with a lot of other cool stuff) are produced. She also invited us to visit with her mom and aunt in the community igloo. This igloo on the edge of town was built by the elders to promote traditional knowledge and skills to the younger people in town. 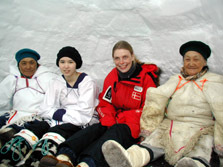 Everyday a couple of elders gather with young people in the igloo. They sit on the snow benches covered in caribou skins inside the igloo (this one even has windows made out of ice). It is heated by a two burner Coleman stove just like ours and they share their incredible knowledge about the land while teaching practical skills like how to make hunting tools, sew kaniks, preparing caribou hide, and the art of singing and legend story telling. The igloo was extremely cool! It had an entrance room, a storage room with a little fire place and 2 "living" rooms. The doors in between each room were made out of caribou hide. The two living rooms had large snow benches and a working bench. We became very envious considering how much nicer this is than our little tent! People around here lived in igloos - which they explained to us were much larger and fancier than this one - up until mid 1960's when Baker Lake became "a community". Mille visiting in the igloo with Kaviq and her family. Lots of laughing! See, even though the Baker Lake area has been known and inhabited by Inuit for centuries, the village of Baker Lake is very young. In the late 1950's for some not determined reason, the caribou herds on which these Inuit were depended upon did not migrate through this area, leaving the people in starvation. At that time, the policy of the Canadian government was to pick up the all family camps they could find on the tundra by helicopter and gather them into new communities. This decision was probably in large based on the very small knowledge southerners had on the nomadic way of life traditional for the Inuit. It was and is still, even for us traveling on the land, hard to envision how these people can survive - but they have for thousands of years. Most of the communities we are traveling through were formed during this period, even though some had been traditional gathering spots for centuries because of the resources available. Baker Lake is such a place. Known to live on the land surrounding Baker Lake along the shores of the waters were five different groups; The utkuhiksalingmiut, the Hanningajurmiut, the Akilinirmiut, the Qairnirmiut and the Harvaqtuurmiut. They had most things in common - like how they lived of the land. They all spoke Inuktitut though with different dialects. As they were brought to Baker Lake, the kids had to go to the local school, built in 1958, and here they were taught in English - Inuktitut was not allowed. Inuktitut has different letter system than our roman style of writing. Today, the Inuktitut language is quite strong in this community, and the students have Inuktitut classes from K through 12. What we think is pretty wild is that the many different dialects have even survived in this community, leaving Baker Lake with at least 7 variations of the Inuktitut language. Yesterday, when we visited with a 10th grade social study class they explained to us how that is both pretty cool, but also a little tricky, as you have to say it is an amazing historic survival of language which ties people together, but also you could envision how it "groups" people. One girl, Felecia told us how her family speaks all English and she was not taught Inuktitut in school until 7th grade, so she only speaks very little Inuktitut. She is quite sad about this, as she feels she is missing something - an important part of who she is. So, it is not just Mille who feels language is an important part on "Who Am I." What about you? Is your language and lingo between your friends important to you? Join in on this "what makes us who we are" in the "Who Am I" collaboration zone. Friday afternoon we had a great chat session (you can visit the Lotus Sametime chat transcript by clicking on any of the Chat links in the collaboration zone) with a bunch of you on this subject, and it sounds like a number of schools were going to return to this zone and start working together on sharing information. Remember, you can actually chat with another school by entering a collaboration zone and clicking on the chat icon. We can't wait to see what you have come up with when we reach the next village! We will start out on the trail tomorrow morning, weather permitting. The dogs are fired up and the sleds packed with new supplies and warm memories. Ma'na (Thank you) Baker Lake! Orin Durey and his student Patricia Tapatai checking out the Sametime chat Friday.